THE YOSHIDA FAMILY OF WOODBLOCK ARTISTS. HIROSHI YOSHIDA was born in 1886 and lived until 1950 and began his artistic life a a painter moving to woodblock prints in the first quarter of the 1900s. He quickly became a leading figure in the Shin Hanga movement of the time and created a number of woodblock prints in this style. TOSHI YOSHIDA was the first son of Hiroshi Yoshida born in 1911 and he lived until 1995. He learned painting and woodblock print making from his father from an early age and is thought of as one of the 20th Century masters of the art form. In 1936 he lived for some time in Korea and China and after the second world war he traveled to many places in the world. In 1980 he opened a woodblock print making school in Nagano. SIZE: 77.5cm x 39.5cm (30.5 inches x 15.4 inches) to outside of frame. Artist’s signature and seal in lower right of scene with Franklin Mint Copyright dated 1979 on back of frame. HODAKA YOSHIDA is the second son Hiroshi Yoshida. He was born in 1926 and began his career as an artist creating woodblock prints in 1950. 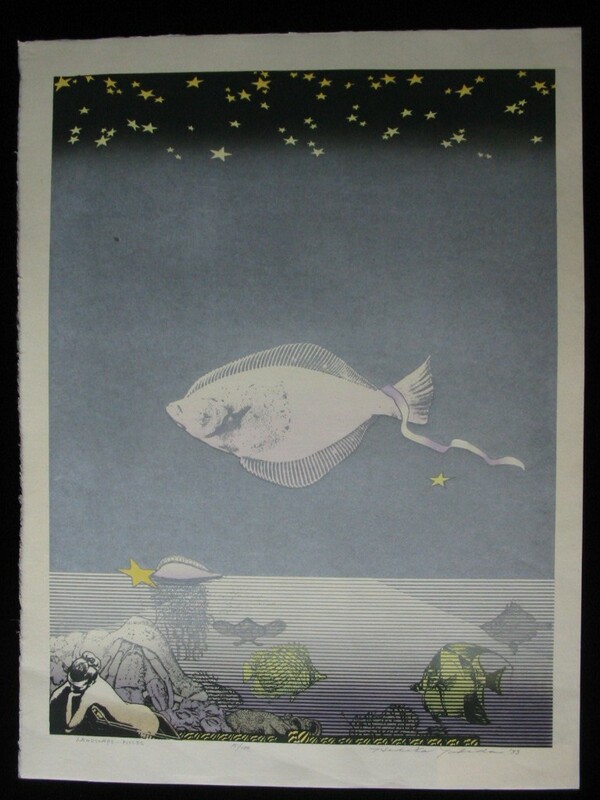 His first exhibition was only one year later at the Hanga Kyokai – Japan Print Association – annual exhibition . He never created a huge number of woodblock scenes preferring to focus on expanding his unique, individual style. FABULOUS VERY RARE, VERY LARGE LIMITED EDITION. HAND SIGNED, NUMBERED 15 of ONLY 100 EVER CREATED AND DATED 1973 ALL IN PENCIL BY THE ARTIST IN THE BOTTOM MARGIN. 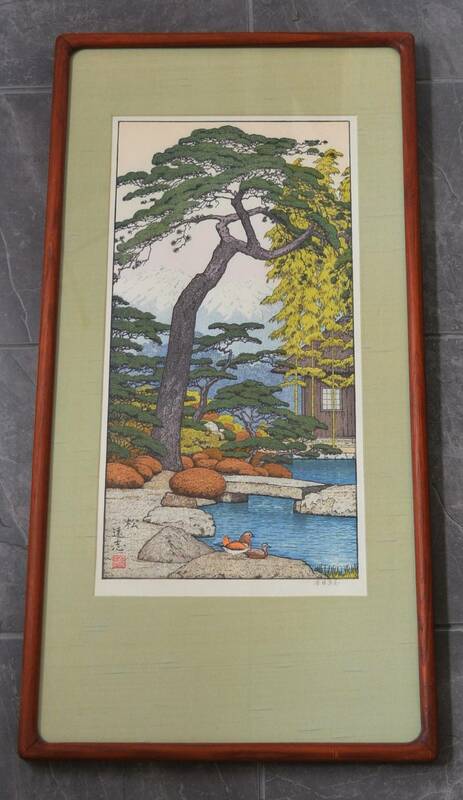 IN AS NEW CONDITION, KEPT IN SAFE STORAGE SINCE PURCHASED MANY YEARS AGO AND A VERY VALUABLE WOODBLOCK PRINT. TSUKASA YOSHIDA is the second son Toshi Yoshida. He was born in 1949. 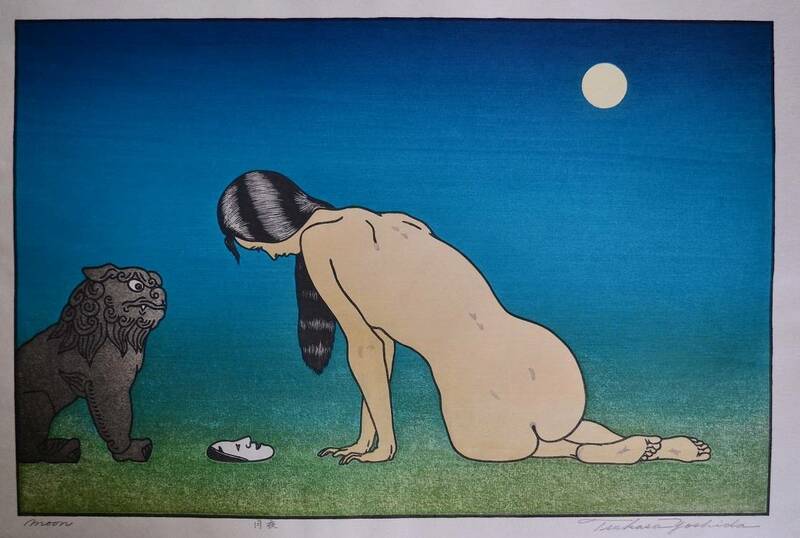 His woodblock prints display a unique style and in 1981 he took part in the exhibition “Three Generations” held in the famous Philadelphia Art Museum which was entirely devoted to the Yoshida family. Tsukasa represented the third generation in this museum art show and continues to produce fabulous art works in honour of his family.